Brogdale Farm in Kent is one of the few places in Britain where you can celebrate Hanami, the Japanese festival dedicated to the annual cherry blossom. Celebrate the Blossom Festival at Brogdale Farm. Good news – you don’t have to fly all the way to Japan to celebrate the Japanese tradition of Hanami. Hanami picnics are starting to catch on in the UK. For a really unique day out visit Brogdale Farm in Kent, home to Britain’s national collection of fruit trees. It’s also the world’s largest collection, so what better place to picnic underneath the cherry blossom? I love coming here and then driving the short distance to Whitstable for a seafood supper by the sea. Whitstable is one of the South-East’s top seafood destinations and there are some great places to eat in this quirky and charming seaside town. There are two ways you can celebrate Hanami at Brogdale Farm: either visit for the Hanami Festival day or invite your friends to join you for a picnic in the orchards (available on key dates). Just keep an eye on their cherry blossom forecast. Altogether, it’s a fantastic spring day out in Britain and an easy day trip from London. Trains run direct from London Victoria and St Pancras International to Faversham station and take around 90 minutes. It’s a long-held spring tradition in Japan for friends and families to come together and enjoy an afternoon relaxing together under the cherry blossom. Sharing a picnic under the beautiful trees is a unique and ‘not to miss’ event. But where are the best places in Britain to see the annual cherry blossom? You may be surprised to hear that one of them is a farm in Kent. Throughout the month of April, Brogdale Farm, near the Kent coast, has an abundance of cherry blossom. What’s special about the farm is that it houses the nation’s collection of fruit trees and plays a vital role in protecting heritage varieties. The farm has over 350 flowering varieties of cherry blossom as well as apple, pear, apricot and plum trees. All you need is a sunny day, a picnic rug and a delicious spread of food for a lazy afternoon underneath the boughs. The Hanami Picnic Experience is available on select dates in April and tickets must be booked 48 hours in advance. If you are a party of 15 or more, they can provide a ready-made picnic for your group. Otherwise, you’ll need to bring your own picnic with you. Curious to find out more about Hanami and Japanese culture? 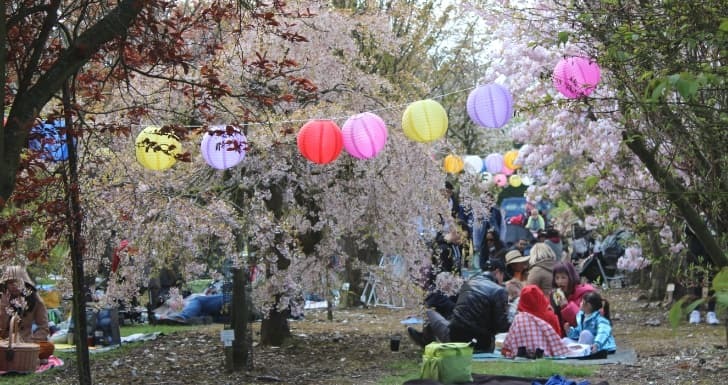 Put a date in your diary for Brogdale’s dedicated Hanami Festival Day. It’s a popular event especially if the spring weather is kind. Hundreds of people turn up with their picnic hampers, thermos flasks and bottles of wine and spread their picnic blankets underneath the boughs. Besides enjoying your picnic you can dip into different aspects of Japanese culture. You can see a traditional Japanese tea ceremony, try on a beautiful kimono, watch a performance of martial arts and a sushi making demonstration. The volunteers who work at Brogdale give guided tours of the orchard. You hop on a tractor-trailor and go for a short ride passing orchards where pears were once picked to make Babycham. A popular drink in the 1970s, Babycham is a light sparkling perry which was invented by a brewer in Somerset. You’ll also discover interesting facts that will give you an advantage if you’re partial to a pub quiz. Did you know for example that the apple, the most English of fruits, originally came from Kazakhstan? The orchard is also home to a Met weather station. The UK’s hottest ever temperature was recorded at the site. In response to climate change, Brogdale is conducting several temperature-controlled trials in order to protect our fruit growing in Britain. Dogs are not allowed at Hanami Festival or picnics as the celebrations take place in the orchards. Ready to book tickets for the Hanami Festival or Hanami Picnic Experience? Visit the Brogdale Website.